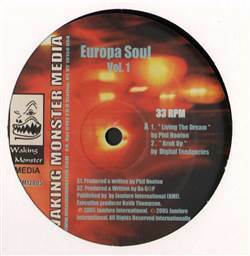 Various - Europa Soul Vol. 1 12"
BREAKS, Waking Monster, USA, 2005... Breakbeat, House, Jazzdance with Phil Hooton - Living The Dream, Digital Tendencies - Bruk Up, And Nermin - Time And Also Give In To You. Brainbug - Nightmare 2002 12" Meat Beat Manifesto - Radio Babylon (Disc 2 Only) 12" Raiven Maize - The Real Life 12" El Salsero - Baila Miami 12"
AtmospheriX vs. DJ ATX - What I Need 12" DJ Warchild - Street Knowledge 12" Cortex - Just One More Time / Adrenalin 12" Fun-Da-Mental - Why America Will Go To Hell 12"